With the explosion of the digital economy, the best digital professionals are much in demand and expensive. How then do you retain good staff and ensure you get the best return on investment? Although I began my career as a web designer working in the faceless cubicles of IBM, I now spend most of my days advising clients about their digital strategy. Even though I have moved on, my painful experiences at IBM continue to have a profound effect on how I think digital workers need to be managed. When we think about digital strategy, most of us immediately think of digital assets such as websites, social networks or mobile apps. 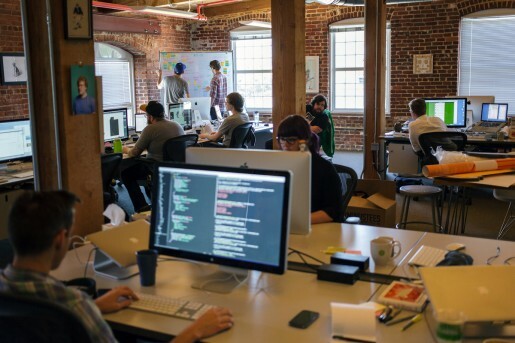 Rarely do we spend much time thinking about the team that creates and maintains these apps. Lots of attention is given to governance issues such as reporting lines or policies, but little to the happiness or creativity of our staff. This strikes me as madness considering these employees are much in demand and their effectiveness so crucial to the success of our digital strategy. How then can we ensure our staff are happy, productive and creative? How can we get the most out of them? There are many factors in getting the most from your digital staff, but one factor that should be near the top of the list is the working environment. As part of my work I visit a range of companies from large corporates and traditional businesses to the new generation of digital companies. The difference between pre and post digital organisations is striking. The difference between pre and post digital organisations is striking. Walk into most pre-digital companies and you will find cubicle hell. As you walk down the aisles, heads pop over the barriers glancing around like frightened meerkats afraid of a predator. There is little noise apart from the tapping of fingers on keyboards and the occasional person on the phone. Walk through a post-digital company such as Google, Valve or Twitter, and the atmosphere is totally different. They are almost always open plan with half finished work and wireframes covering the walls. Huddles of people sit together talking and sketching out ideas. There is a buzz in the air and a bustle of activity. 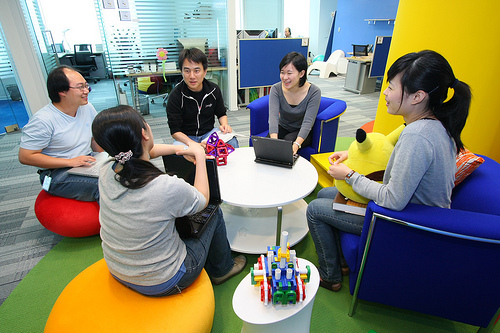 Offices such as Google have a buzz in the air and bustle of activity. One is an environment that nurtures collaboration and interaction. The other has an almost factory line mentality, with people working in isolation. The factory line does not work in the digital economy. Successful digital projects require multiple specialists working closely in collaboration with one another. It needs the designer and developer sitting side by side. It requires the copywriter and project manager close at hand. It requires a more agile, iterative and dynamic approach. Something that is hard to achieve in most traditional workplaces. What then can be done to improve the working environment? The first and most important step is to pull down the walls. You will have gathered by now that I hate cubicles, but not all open plan offices are any better. Yes, start by pulling down the physical barriers, but you need to challenge the mental ones too. Working in cubicle hell at IBM taught me how crucial your working environment is. If everybody in your office has always sat in the same place and each person has their own assigned desk, then perhaps it is time to shake things up. Ben Chestnut, the CEO of email marketing company Mailchimp, does exactly that on a regular basis by periodically rearranging the desks. The idea is to prevent everybody from being stuck in their silos and never interacting with other parts of the business. His aim is to encourage collaboration across teams as well as within projects. The games company Valve goes a step further. 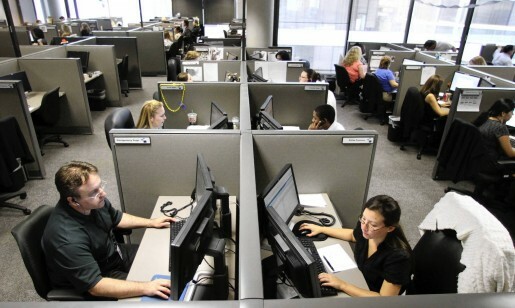 All of their desks have wheels and employees are encouraged to move their desks around the open plan office. If you want to work with somebody, simply wheel your desk over to them. I am not suggesting we all need to strap roller-skates to our desks, but we do need to create a work space that will flex to accommodate changes in teams and projects. This might be something as simple as having spare desks spread around the office that people can use, or desks big enough for two people to sit at comfortably. Flexibility is about encouraging collaboration, but it is not the only way to achieve that. Having the right places to display and discuss also help. I have come to dislike meeting rooms. Not only do I dislike the idea of going to a separate room to talk to a colleague, the practicalities often turn into a nightmare. Because of organisation’s obsession with efficiency (a concept stuck in the mentality of the industrial economy), they rarely ever have enough meeting rooms. They often have to be booked days in advance and you cannot afford to overrun by even a few minutes. My problem with meeting rooms is that they are a temporary meeting place. However, my biggest problem with meeting rooms is that they are a temporary meeting place. You go to a meeting room, discuss whatever and then return to your desk. Sure you can pin up work, sketch on whiteboards and plaster the walls with post-it notes, but they all have to come down at the end of the meeting. For a digital team to be at its most effective they need areas that support impromptu discussions and allow work to be constantly on display for quick reference. Mailchimp resolve this issue by having a large number of whiteboards that can be wheeled around the office. If people want a meeting they grab a whiteboard and pull it over to their desk. People can huddle around and discuss things right there. Best of all the board can be left up after the meeting for future reference. Mailchimp have whiteboards that can be wheeled around the office allowing impromptu meetings anywhere. Of course all of this collaboration can lead to a noisy open plan office. What about those moments where you need some quiet to think? We have all seen the lavish offices of companies like Facebook or Google. With rooms full of bean bags, hammocks and even giant bee hive pods, it would be easy to dismiss such spaces as extravagant or just down right ridiculous, but is that actually right? Are office spaces like this a ridiculous luxury, or do they serve a purpose? Although the decor might not be appropriate for every company, the principle is sound. Places like this are areas where employees can go and work in comfort and quiet. A chance to isolate themselves so they can better focus. These are also places that people can go to just chill out and step away from their work. This is surprisingly important. Admittedly in a company culture focused on time sheets, efficiency and productivity, this may seem counter intuitive, but in truth you will get more from your digital workers if you give them time away from their work. There is a reason why many digital companies have pool tables, relaxation areas and other non-work facilities. They know that if people have time away from their work, this provides time for their sub-conscious to process a problem. There is a reason why many digital companies have pool tables, relaxation areas and other non-work facilities. They know that if people have time away from their work, this provides time for their sub-conscious to process a problem. We all know that if we sleep on a problem (take a break from it) we often solve it much quicker. 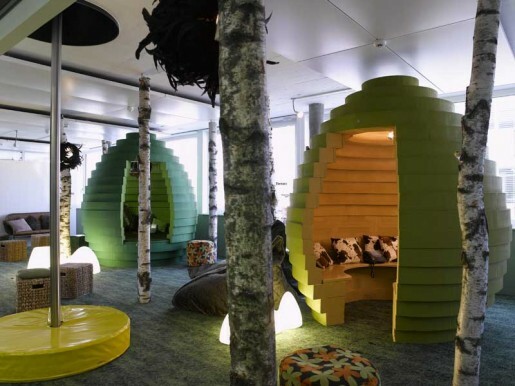 Providing these kinds of spaces allows that to happen and gives employees time to de-stress too. Stress is a significant factor in undermining the productivity of any knowledge worker, and digital workers are no exception. Nothing will make a knowledge worker more stressed than having the wrong tools. You would be concerned if you hired a plumber only to find that he was using the same cheap DIY tools you had. You would expect a professional to have professional tools and yet so often our digital workers are expected to use the same tools as everybody else in the company. They are expected to work on the same computer as somebody in accounting, operate on the same locked down network and go through the same processes to install software. This is just not acceptable and will significantly hamper them from doing their job. It is so important that your digital team has the right tools for the job. That means the I.T. department may have to make an exception to their policies. I understand that I.T. departments like to simplify their work by standardising, but that shouldn’t be at the cost of other peoples efficiency. IWhen people are facilitated to do their job, rather than resisted, they are ultimately happier and more productive. Everybody wins. The truth is that a digital team cannot do their job without access to a wide range of operating systems, devices and software. They need to be able to install their own software, buy their own hardware and have largely unrestricted access to the network. Often I have worked with digital teams who have had to go home in order to circumvent network restrictions or bring in their own hardware because the company wouldn’t by them a mac or a smartphone. You would be forgiven for thinking that the workspaces in digital companies and the ‘fancy’ kit are all luxuries used as perks to attract demanding staff. However, I hope I have demonstrated that this is not the case. Yes, they will attract staff but not because they are seen as a perk. They will attract and help retain staff because they are being given the tools they need to effectively do their job. When people are facilitated to do their job, rather than resisted, they are ultimately happier and more productive. Everybody wins.